Situated in the Northern Alps of France, Val d’Isère ski resort and Tignes ski resort combine to form France’s 3rd largest ski area. The combined ski area brings together these two ski resorts in order to provide skiers and snowboarders with access to year-round snow, immersion in winter sports and a little luxury that every holiday needs. The area is famous for being the home of famous French downhill skiing champion Jean Claude Killy, has a combined 90 high-speed lifts accessing 300kms of high altitude snow sure skiing including a glacier that reaches 3450m. Between the resorts, you can find skiing to suit every ability including beginners, experts, downhill racers or freestyle savants. Val d’Isere & Tignes ski area encompasses several villages including: Les Brevieres, Les Boisses, Lavachet, Le Lac, Val Claret, Tignes and Val d’Isère. We will profile and compare these well-known ski resorts side-by-side. Val d’Isère ski resort and Tignes ski resort are two complementing ski resorts that provide easy laid back ski culture and world famous skiing sprinkled with elegance. Get stuck into Tignes’ purpose built winter sports villages of Val Claret and Le Lac while skiers who want to entwine some glamour into their ski holiday have Val d’Isère at their disposal. Val d’Isère is world famous for giving skiers of all ability a run for their money. Skiers can take advantage of the varying terrain from the large alpine village perfectly placed at 1800m. 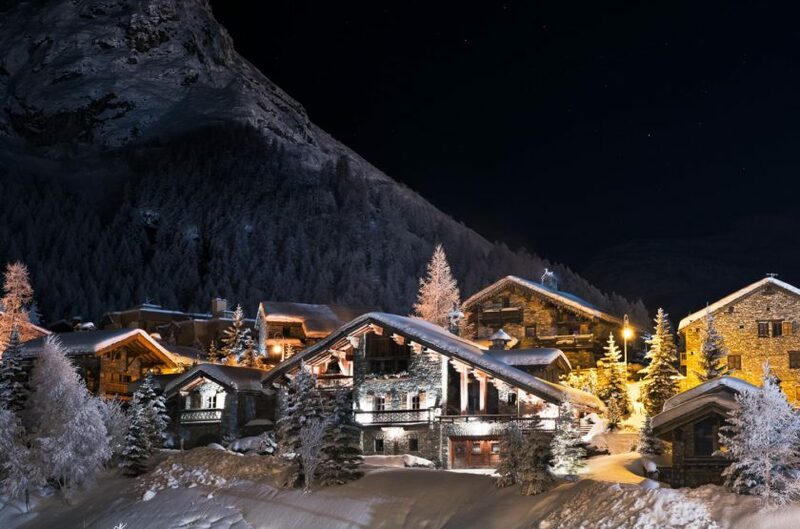 There is glitz and glamour to enjoy after a day’s skiing including the infamous Folie Douce for après-ski that can be followed by a choice of Michelin star restaurants. Tignes is a ski area catering to intermediate skiers who are looking for guaranteed snow conditions. Multiple villages climb the valley up to 2100m including Les Brevieres, Les Boisses, Le Lac and Val Claret. The villages are mostly purpose built from the 60’s and 70’s due to the flooding of the original settlement that created one of Europe’s largest reservoirs. Tignes is the more budget-friendly side of Espace Killy with welcoming bars and cheap eats dotted throughout. The skiing across Val d’Isere & Tignes ski area is excellent due to the vast majority sitting above the tree line and even glacier skiing through summer months. Val Claret’s 2100m altitude offers a base for easy ski-in-ski-out access to Tignes’ 150kms of pistes including the lighting quick funicular that delivers you from the town up onto the Grand Motte Glacier that reaches 3450m. Intermediate skiers can enjoy the bulk of the Tignes’ due to perfectly pitched slopes and access from 39 high-speed lifts. The long wide open runs are perfect for improving your ski ability and enjoying cruisey sunny afternoons on the piste. Val d’Isère offers a slightly wider range of skiing options up to nearly 3400m, although it does not have direct access to the Grand Motte. Val d’Isère’s 150kms of skiing, served by 42 high-speed lifts, comprises of simple green and blue runs that wind their way across the valley. In addition, more advanced skiers can take on La Face which is famous for hosting the fierce 1992 Winter Olympic downhill course. Take either a 1 valley lift pass or upgrade to the full Val d’Isere & Tignes lift pass if you want to explore both Val d’Isere & Tignes. Tignes is ready for anyone who just wants to concentrate on their skiing and snowboarding with no frills attached, even in the summer months. Val d’Isère provides a rather more sparkling balance of skiing mixed with luxury to make a ski holiday all rounder. If you are interested in comparing more of the ski resorts in Savoie region of France or comparing any ski resort on the planet, you can visit the Snowcomparison website or go straight to their Compare Ski Resorts page https://snowcomparison.com/compare.